The heinous Beast of Revelation prowls through the last Book of the Bible. Many people have tried to explain who or what is this Beast of Revelation. We will turn to the Holy Scriptures to see the clues it offers us. Even a brief glance reveals the Beast is a symbolic term. The question is: What does it mean or whom does it represent? With symbolic terms it is important to know how they are used in other portions of Scriptures for symbols very rarely change meaning. The word `beast' is directly used as a symbol in only two sections of the Bible: Daniel and Revelation. This vital clue plainly tells us that the beasts of Daniel represent kings or world rulers. A careful reading of Daniel 7 and Revelation 13 will show, I believe, the fourth beast of Daniel and the Beast of Revelation are the same. Now we have a good starting place as we turn to the Beast of Revelation. In Revelation 17 we see the "scarlet beast, full of blasphemous names, having seven heads and ten horns". [Rev. 17:3, NAS] The angel promises to explain the Beast to John. Verses 9 and 10 are the explanation: "...the seven heads are seven mountains on which the woman sits, and they are seven kings..." Here, we have confirmed in the mouth of two witnesses the Beast of Revelation is going to represent a king or world ruler, although we should note here these verses indicate a double meaning for the Beast of Revelation. Not only does the Beast represent seven kings, but also seven mountains. We will examine the seven mountains later. Before we can even attempt to put a name on the Beast of Revelation, we have to consider one other question. In which time frame are we to look? Is the Beast someone in the past, the present, or the future? Scripture anchors this down for us in verses 10 and 11 of chapter 17. "...and they are seven kings; five have fallen, one is, the other has not yet come; and when he comes, he must remain a little while. And the beast which was and is not, is himself also an eighth, and is one of the seven, and he goes to destruction." [NAS] The angel specifically states that the sixth king is reigning as he is speaking to John. This is the natural reading of the text. Since the Beast of Revelation represents seven consecutive kings and the sixth king was reigning when John was living, we know we have to look for the Beast in the past - in John's lifetime. Looking in any other time frame would mean twisting the natural meaning of the angel's words. Now that we have our time frame, let's return to the seven mountains. What are they? Which seven mountains were famous in John's time? 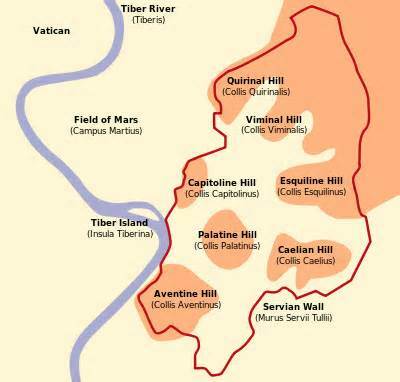 The seven mountains on which the city of Rome was built. The double nature of the Beast of Revelation reveals it can represent two different yet related things. So, if part of the Beast symbolizes the city of Rome then the seven kings must be seven world rulers or emperors of Rome. Fine, but which seven emperors? Since it says five have fallen or died it must be referring to the first seven emperors otherwise more than five would have died. It also predicts the seventh king will reign only a short time. Did that happen? Galba was the seventh emperor. He ruled for nine months - by far the shortest reign of any emperor up to that point. What about the Beast of Revelation being an eighth but also one of the seven? Notice it does not say 'the eighth.' All the future emperors of Rome are melded together into 'an' eighth, and yet they are inescapably part of the first seven which gave Rome its direction. Now that we have a working theory, let's examine Revelation 13. This chapter talks more about the Beast of Revelation than any other chapter. If our theory is correct then it will have to pass the acid test of chapter 13. The first two verses show the horrible Beast of Revelation coming out of the sea and receiving his anti-God nature and power from the dragon. The dragon is Satan and the sea is the sea of nations. Here we have Rome being prepared and empowered by Satan for his diabolical work. Revelation 13:3 is amazing. This Beast suffers a fatal wound, but recovers and the whole world is surprised and follows the Beast. How does this fit in with what we've said above? Can it really be traced in history? Here we must go back to the duel nature of the Beast of Revelation. It can represent the Roman Empire in general [as centered on the city of Rome] or it can represent a specific emperor. In the context of the first two verses, we see the Roman Empire rising out of the sea of nations to violently dominate the world. So, we then can conclude that verse 3 continues with the Roman Empire generally and not a specific person. 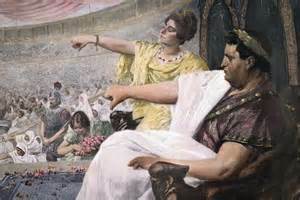 In AD 68 the last blood-line emperors, Nero, committed suicide. The following year became infamously known as The Year Of The Four Emperors. In the space of one year four would-be emperors took the throne and three were assassinated. The Roman Civil War ripped the empire apart and the watching world thought it was dead. However, Vaspasian left the Jewish War in the hands of his son, Titus, and returned to Rome. He was able to end the civil war and become the next emperor. In the ten years of his reign he was able to bring the bankrupt and demoralized Roman Empire back to being a stable world power. The Beast had suffered a fatal wound and had recovered. The world was amazed and followed after the Empire again. Let's move on, testing our theory verse-by-verse. Verses 5-8 describe the Beast's actions in more detail. 1. The Beast will blaspheme. 2. He will make war on the saints for forty-two months. 3. He has authority over every tribe and people. 4. All non-Christians will worship him. How does our theory stand up to this? Number's one and four are shown in the great Emperor cults. Emperor worship was demanded. The Emperor Caligula believed himself to be a living god. Emperor Nero accepted worship and such titles as 'Almighty God', 'Saviour', and 'God and Saviour'. To refuse to worship the 'divine Emperors' was considered an act of treason. Next, number two, did Rome really make war [or persecute] the Christians for forty-two months? Forty-two months is three and a half years. The first Roman persecution of the church began a few months after the Great Fire of Rome, which occurred on July 18, 64. It ended when Nero committed suicide on June 9, 68. As you can see, this covers a period of three and a half years. And finally, number three. Yes, Rome had power over the known 'civilized' world. In fact, in Nero's reign, there were three major up-risings and each one was defeated by the seemingly invincible Roman armies. All known countries were in the vice-like talons of the Roman eagle or wary of it. In verses 11 and 12 we see another Beast of Revelation. This Beast is related to the first Beast. Remember how chapter 17 revealed the Beast could represent either the Roman Empire in general or a specific emperor? In the first part of chapter 13 we have seen the Beast of Revelation represent the Empire generally speaking. This second Beast of Revelation is unconditionally linked to the first Beast making him a specific emperor. This is confirmed when verse 18 states that it is the number of a man. Let's list the major characteristics of this Beast as found in verses 11-19. 1. He has two horns like a lamb but speaks like a dragon. 2. He makes everyone worship the first Beast. 3. He does great signs. 4. He makes a living image of the Beast. 5. Everyone has to receive his mark before they can buy and sell. 6. His number is 666. That's quite a list! Does any emperor meet it? 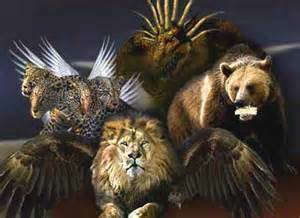 We know the Beast of Revelation cannot be one of the first five for they are already dead. The seventh, Galba, did not initiate the persecution of Christians. That leaves us with number six - Nero. Nero became infamous for his total depravity and cruel persecution of the church. Let's see if he passes the test and matches each point given to John. 1. This is interesting since a lamb does not have horns. Symbolically horns represent power and a lamb is know as being gentle and mild. So here we have someone with great power who is mild and gentle and yet will eventually roar like a dragon. Does Nero fit this? In the beginning of his reign Nero exercised his power in a mild non-confrontational way. He restored power to the Senate and allowed many much-needed government reforms to take place. He was guided by two men, Burrus and Seneca. When Burrus died and Seneca retired things rapidly changed. The lamb image faded and the dragon roared. Nero became driven by his own vile passions and no one was safe. 2. Nero increased the emperor cults and demanded worship as the representative of the first Beast of Revelation. Anyone who failed to worship the `divine Nero' or respect his `divine talents' [especially singing] was put to death. 3. He does great signs, even making fire come down from heaven. This whole section of Scripture is given in symbolic terms. So just as the Beast of Revelation is symbolic so are his signs and the fire. Fire represents judgment. In bringing down fire from heaven, Nero was the instrument of God's judgment on the nation of Israel for their part in crucifying the Messiah. It was under Nero the Roman armies were sent to Israel to crush the Jewish Revolt. Nero's reign also fulfilled the great signs given by Jesus in Matt. 24 [which Jesus prophesied must happen to His generation]. 4. Nero's signs of judgment, world conquest, and total power inspired the world to worship Rome. As part of worshiping the Beast of Revelation people made images or statues of Nero. In AD 55 the Senate made a statue of Nero as large as the statue of the god Mars and placed it in the temple of Mars. The Greeks identified Nero with their chief god Zeus and placed Nero's statue in the Temple of Apollo. That's all fine, but what does it mean by a living image? The word here for living [or life in the KJV] is the Greek word Pnuema. It is normally translated as: wind, breath, spirit, and is used of the Holy Spirit. So when it speaks of giving the image life it does not necessarily mean that the image is going to get up and walk around like some science fiction nightmare. Instead, it is speaking of a spiritual act. Nero imparted his `spirit' or `life' to the statues in that they were to be treated as he himself was treated. To dishonor the statues was the same as dishonoring Nero or Rome. Upon his defeat the king of the Parthians laid his diadem down at the feet of a statue of Nero and worshiped. One Roman Senator was put to death because he did not sacrifice to Nero's divine Voice. When it came to worshiping the image of the Beast, whether a statue or Nero's talents, no consideration was given to a person's nationality or social status. It was either do it or die. 5. What about the famous mark of the Beast of Revelation? What is that? In this chapter, which is apparently dealing with symbols, it would be illogical to suddenly change to a literal interpretation here. In context the mark must be symbolic. For example, in Rev. 7:3 we see the people of God receiving a symbolic mark on their foreheads. Here in chapter 13, we have the Satanic opposite - a symbolic mark on the people of the Beast. Everyone had a symbolic mark: it was either God's or Rome's. They were set aside for one or the other. Those who opposed emperor worship were going to find themselves opposing Rome itself in all its power and vengeance. The city of Rome was not self-sufficient. It had to import a lot of food. As much as one-fifth of this food was handed out or sold below market cost as part of Rome's welfare system. In order to enter the marketplace to buy or sell a person had to offer incense to Caesar. Many Christians viewed this idolatry and refused. During that three and a half year `war', Christians were denied even the basic activities of life. 6. What about his number being 666? In the Hebrew [and Greek] alphabet each letter also represents a number. It was quite common in those days to add up the numbers of a person's name. For example, writings have been found from that era which say things like 569 loves 468. Since more that one name could add up to the same number only people `in the know' could be sure who was being referred to. While more than one name could add up to 666, anyone whose name does not add up to 666 can be eliminated as a possibility for the Beast of Revelation. Does Nero pass this final test? When the numbers of the Hebrew spelling of Nero's name are added up, they equal 666. In the time frame in which the Scripture allows us to look for the Beast of Revelation, Nero fits the description best. He passes each and every test. It is hard for us from our perspective to realize just how devastating that three and a half year war against the church was. But the newborn church needed to be warned it was coming and to know it would not last forever [even as persecuted Christians need to know today]. They needed to know, as their lives were ripped apart and their faith tested to the core, that Jesus was still Lord. Nero might claim to be god but he would go to destruction. Even the Roman Empire itself would one day be totally destroyed, as the Book of Revelation predicted. Of course the reader will realize in order for Nero to be the Beast, the Book of Revelation must have been written during the early part of Nero's reign when things were basically quiet. While there is much disagreement on the subject, I believe the internal evidence points very strongly to an early writing date. 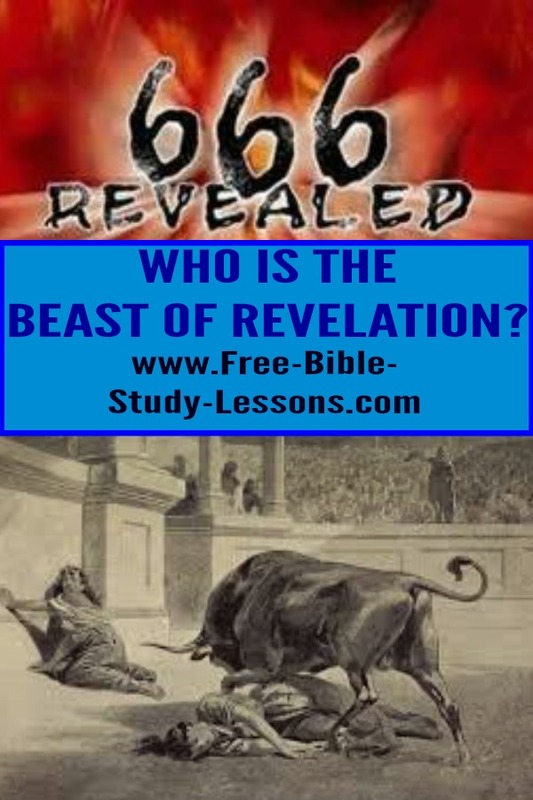 For a more complete study of the beast of Revelation and of the entire Book of Revelation sign up for our Revelation e-mail course.